The first time I ever took a Blythe out for photographs was at school, in the very early morning hours when there was hardly anyone there. I picked mostly secluded areas with decent lighting. I was a big chicken about being out and about with my dolly photography. I felt shy about it because, well, there I was holding a doll in one hand and a camera in the other. While at school. (Let’s not forget that I go to a huge school with more people than I could probably care to count [or even care about].) Maybe I just didn’t feel like being the girl that someone would go home and write a Facebook status about? Saw a crazy girl at school today. She was holding onto a doll. She looked like she was about 12? I have gotten better, but not as comfortable as I would like to be. 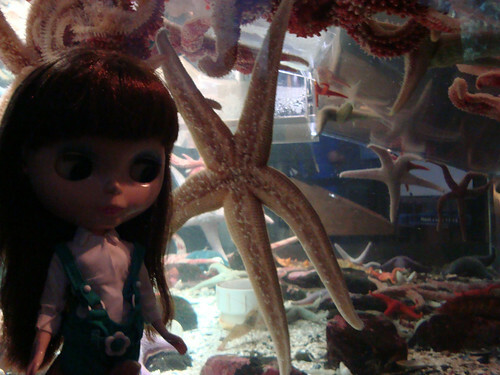 I did take one of my dolls to the aquarium and got some fun shots there (poor lighting indoors, but still – it was fun!). There’s a lot to be said about how much more fun it is when you’re not feeling embarrassed about taking photos of dolls out in the open. When I was at the aquarium with my sister and Kindred, I was far more shy about public dolly photography than my sister was. Of course, she may have been tired of hearing me go “But there’s people around!” all the time. I still feel a little uncomfortable when taking a doll out for photos. I suppose it’s just one of those things that I need to work on. I do hope that being around a whole bunch of fellow doll fans will help with my shyness of taking photos of dolls in public over the next couple of days though! Were you shy about taking photos of your dolls at first? When did you get over this shyness (if you have)? I was… a bit. but I believe in taking the plunge and took Strawberry to one of the most touristy places in town at our first outdoor photoshoot. Some funny Spanish ladies commented and we exchanged some nice words. I feel that when you look REALLY concentrated, taking pictures of your doll, people tend not to bother or look at you much. Of all the countries where I’ve photographed a Blythe outdoors so far (Portugal, England and Germany) it was in Germany where I got the most stares, yes, not in Portugal. Here in Portugal people simply don’t care much, sometimes, usually an old lady approaches me, but no one makes fun or says bad jokes. I am still pretty shy about taking my dolls out in public. I have been to a couple of meets to try get over my shyness and it is a lot easier when you are with like minded people. Although that does tend to mean you get more stares as there is a large group of grown women with dolls. Mostly they seemed good-natured stares though! A few people have been genuinely interested in our dolls too so I’m starting to think it’s mainly in my mind. Once someone did take a picture of our meet without asking our permission though which I thought was highly rude! All that said I do tend to wimp out a lot though. I still am scared to go in public with my dolls. I’m still super scared 🙁 I even brought my Ainsley with me MetroCon (an anime convention in FL) this past weekend and intended to take pictures but I just got so nervous I couldn’t. I regret that I didn’t now. I wish I’d at least tried.